WhatsApp is continuous expanding its reach in India, recently they have gained 200 Million monthly active users in India. This mark makes India the biggest market of WhatsApp users around the globe. Earlier, WhatsApp had revealed that it had 160 Million users in India in the month of November, which means they have succeeded in adding 40 Million in just 3 months. WhatsApp which was earlier launched as a messaging app has expanded its portfolio by voice and video calling, an improved set of emoji’s, two-step verification, and the recently added status messages, similar to Snapchat and Instagram stories. 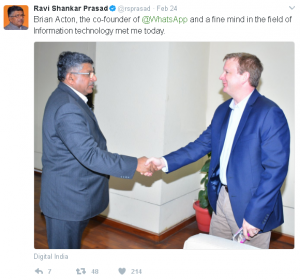 Recently, Brian Acton met with India’s IT Minister Ravi Shankar Prasad to discuss the ways in which WhatsApp can contribute to India’s vision for digital commerce. The company has already said that it plans to roll out commercial messaging this year for businesses, as it looks to tap into enterprises for monetizing its platform. Renowt Ulefone U007 Pro 4G Android Smartphone at Rs 156 – BEWARE!!! !